This is your weekly reminder that you're doing MLS fantasy, and if you're taking part in our league you should probably set your rosters so you have an opportunity to win something TBD. And really, since you're probably not doing any work with the NCAA tournament going on, you have some time to make sure your lineup is good to go this week. If you aren't in our league yet, and for some reason you feel the strong need to join, you can do so by figuring out how to use this code: 9593-1668. We grade on a pass/fail scale. If you get in you passed. Here is the current week's worth of data. It's in a jpeg format because, frankly, tables show up for crap on our site and we'll be moving soon enough to this other site that... well, we'll tell you more when we're at that stage. Here are the main take aways for this week. - Stop making Darlington Nagbe your Captain. - Will Bruin continues to make me look stupid. - I'm average, and if you are below me, you are not doing yourself any favors. - I'm ahead of both Matthias and Drew, so while I'm the idiot of the podcast I've so far shown to be the better fantasy player. - I totally lucked out with Zack MacMath this week. Now the below image is for the week 2 "dream team" which is basically how you could have gotten the most points last week. 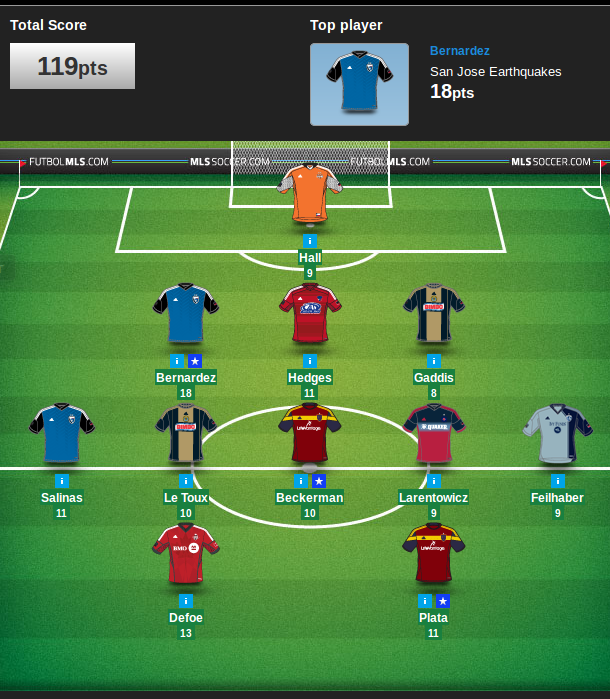 Interesting that no one from our league sported a 3-5-2 formation this week and that three main formations were kind of cycled through for everyone. 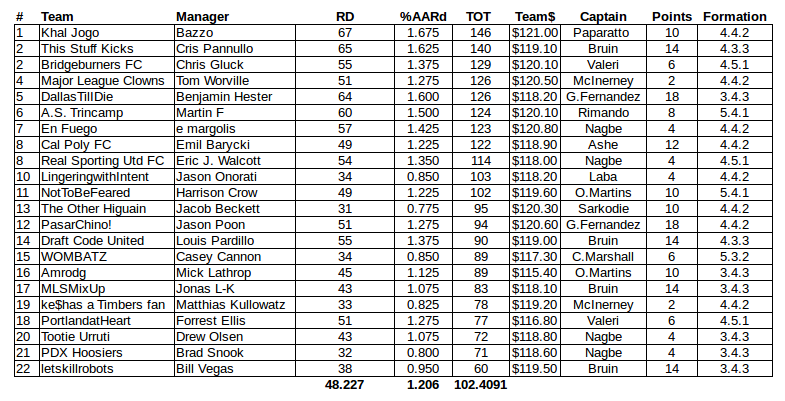 Good luck to you all, and we'll see if we can ever catch up to either Bazzo, Cris Pannullo or Chris Gluck. They look poised to possibly run away with this thing. Hopefully this week will set them back so the rest of us can feel better about ourselves.